Imperium Romanum Inde a bellow Actiaco usque ad Diocletiani Tempus. 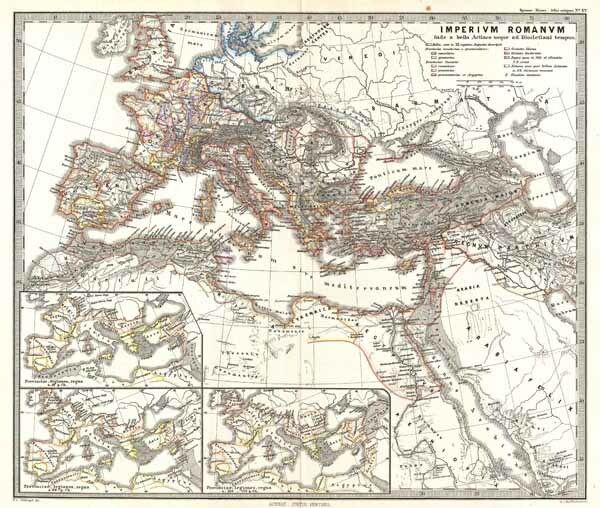 A particularly interesting map, this is Karl von Spruner's 1865 rendering of the Roman Empire under Diocletian (224 – 311 AD). Centered on Italy, this map covers the whole of continental Europe extending as far north as Ireland, as far east as the Caspian Sea, and extending southwards to include Roman holdings in North Africa, Egypt, and the Middle East. Like most of Spruner's work this example overlays ancient political geographies on relatively contemporary physical geographies, thus identifying the sites of forgotten towns and villages, the movements of armies, and the disposition of lands in the region. This particular example focuses on the tumultuous period prior to the ascendency of the Emperor Diocletian. Diocletian presided over a bloated empire verging on decline and to prevent this established the 'Tetrarchy,' or 'rule of four,' in which the Empire was divided in to four segments under four different emperors. This set the stage of the division of the Roman Empire in eastern and western empires under Diocletian's heir, Christian emperor Constantine. Three insets in the lower left quadrant show the disposition of provinces, legions and kingdoms at different periods. As a whole the map labels important cities, rivers, mountain ranges and other minor topographical detail. Territories and countries outlined in color. The whole is rendered in finely engraved detail exhibiting the fine craftsmanship for which the Perthes firm is known. Of particular interest to classical scholars. Rumsey 1626.015. Phillips (atlases) 3288. Espenhorst, J., Petermann's Planet, p. 397-404. Espenhorst, J., Andree, Stieler, Meyer & Co., p. 148.